The Polka King (film, 2017). An American biographical comedy film by Netflix. Directed by Maya Forbes. Official Trailer. The Polka King is an American biographical comedy film directed by Maya Forbes. 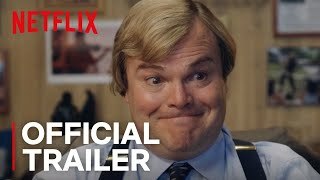 The Polka King | Official Trailer | Netflix. The film opens at a performance of Jan Lewan's (Black) polka band in Pennsylvania. Near the close of the show, he brings his wife Marla (Slate) onstage. A former beauty queen, Marla is modeling some jewelry that Lewan sells at his souvenir store. After the concert, Jan recounts to a happy concertgoer how he and Marla met, and how he has worked every terrible job imaginable, from dishwasher to janitor, in order to achieve the American dream. The clarinetist in his band, Mickey (Schwartzman), visits Jan at his gift shop in order to quit the band. Jan takes him to a pizza restaurant nearby, and urges him to stay, promising him more money. Mickey feels that Jan has enlarged the band to an unsustainable size, and he reveals that other members are thinking of quitting, especially after a rumor that Jan had hired a dancing bear to accompany the shows. Jan admits that the bear is now part of their act, but he insists that better times are ahead. He then picks up a pizza, and heads out to deliver it. An elderly couple visits Jan and asks about investing in his band. He explains that they are guaranteed a 12% annual return on their investment. The state Securities and Exchange Commission office gets wind of the fact that Jan is taking on investors and sends investigator Ron Edwards (Smoove) to meet with him. Edwards informs Jan that he has not registered properly, making it illegal for him to accept investments. He gives Jan three days to return his investors' money and close down the operation. Principal photography began in mid-July 2016 in Pawtucket, Rhode Island, and later it also took place in Woonsocket and Cranston. The film The Polka King was scheduled to be released by Netflix on January 22, 2017 (Sundance) and on January 12, 2018 (Worldwide). The Polka King got high rating from critics. The audience also likes the film.